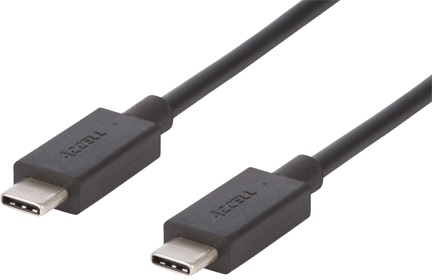 The Accell USB-C to C USB 3.1 Cable allows easy connection between your USB-C (also known as Type-C) host computer to a USB-C device. With reversible USB-C connectors the cable connection works in either direction. Able to charge, transfer data to and power a connected device, this USB-C to C cable with ultra-compact connectors is incredibly powerful. Supporting up to 3A charging output, this full-featured USB 3.1 cable can transmit up to 60W of power, ideal for safely charging or powering USB-C devices. USB 3.1 SuperSpeed+ compliant, this Gen 2 rated cable can transfer data at blazing fast speeds of up to 10Gbps.